Marita coffee 6.0 (100g). Its formula includes Pomegranate, Guarana, Acerola, Mint, Turmeric and Coconut Oil. Their consumption should be associated with a balanced diet and healthy lifestyle habits. Replace your traditional coffee with Café Marita. Buy & Win 8 points. 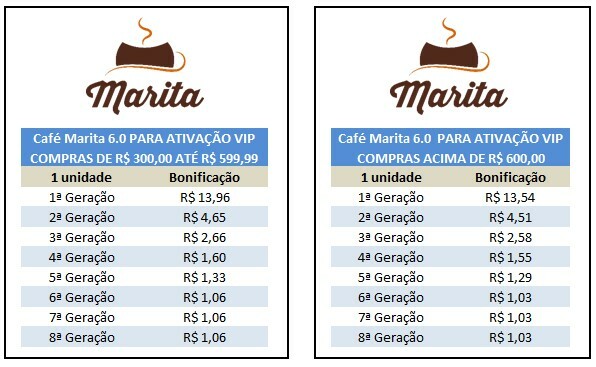 ou 2x s/ juros de R$ 40,00 no cartão. It is a gourmet soluble coffee blend with 6 active ingredients: Pomegranate - Guarana - Acerola - Mint - Turmeric - Coconut oil. Do not change your habit, just change your brand. Take Marita Coffee for a healthier life. 1. Does it contain gluten? Does not contain lactose. May contain milk and soy derivatives. 3. Is it an organic product? No, it's a natural product. 4. How many times a day can it be consumed? As a hot or cold drink, 2 or 3 servings a day. 5. Does coffee have any restrictions or contraindications? No. Only with people with coffee restrictions. 6. Children from what age can you consume? From 5 years, but the recommendation is above 12. 8. Can hypertensive people consume? Yes, but the doctor should be consulted. 9. Can pregnant / nursing mothers consume? 10. What is the correct way to prepare? 11. How many doses can a can? 12. Can it be consumed with milk? 13. Are you registered with Anvisa? It is exempt from registration in accordance with RDC 275. 14. What is the shelf life of the product? Term 18 months and after open consume in 30 days. 15. Does coffee 6.0 help with weight loss as well? It is an essential product for cognitive health (mind) but because it is rich in nutrients like MCT (coconut) it also helps in weight loss. Can be consumed with Marita Stévia sweetener. 17. Can I have coffee at night? It's a coffee, if you already had coffee at night, you can have it. 18. Can it be consumed cold? You can. To be consumed cold, use cold water instead of room temperature. 19. Can the dispensing spoon be stored in the coffee carton? Yes, because the plastic approved by Anvisa. For good results, take the Marita Coffee 3 times a day, before the main meals, with water and sweetened with Marita Stevia. But if you are accustomed to having coffee four five times a day, you can also have the Café Marita four or five times a day. Do not change your habit, just change your brand. Take Marita Coffee for a healthier life. maravilhoso! somente a rede facil brasil para nos trazer estes excelentes produtos!